Long considered one of the world's most significant wartime mysteries, the fateful dusk encounter between HMAS Sydney (II) and the German raider Kormoran stands as Australia's single largest naval disaster. The loss of both ships on the night of 19 November 1941 with Sydney's full war complement of men and boys sparked a growing mystery spanning sixty-six years for Australia's most famous fighting ship and for one of Germany's best known raiders. The 2008 discovery of the wrecks captured the imagination of two young researchers who dreamt and then lived their impossible dream — bringing what lies in total darkness on the seabed nearly three kilometres beneath the waves and over 100 kilometres from the coast to the surface for all to experience. This had never been done before. Needing a state-of-the-art ship and its crew, the most modern of underwater vehicles, state-of-the-art visual modeling and reconstructive imaging technology, an unheard of array of mounted lighting and cameras, and the support and services of some of Australia's leading scientists, maritime archaeologists and historians, they succeeded beyond their wildest dreams. 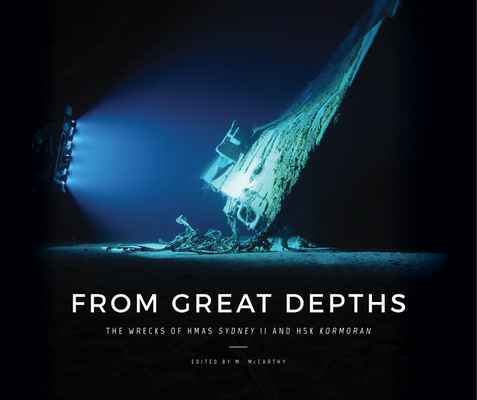 From Great Depths features the results of their astounding success, presenting absolutely stunning underwater photography and fascinating new discoveries, brought together with inspiring and heartrending personal accounts of wartime service on the ships, and their fierce battle with the devastating loss of over 700 souls from both sides.